Elisa Schaar comes originally from Germany. Inicial professional career as individual psychologist. Artistic autodidactic formation and apprenticeship, participation in numerous art-workshops. Since 1975 she has been experi-menting with different painting techniques. 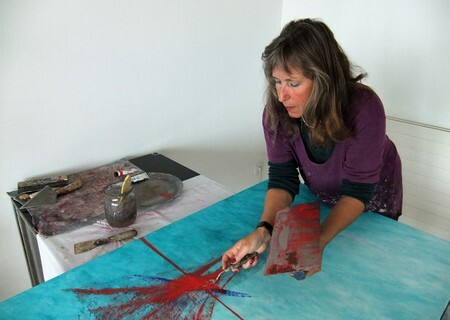 From 1999 on she paints with acrylic on canvas, situated in the field of abstract expressionism, using spatulas, trowels and wipers as instruments. From 2006 on she is living and painting in Caldetas/Barcelona. Associated member of Associació Sant Lluc per l’Art, Mataró/Barcelona. Various educational journeys to Europe, USA, Asia and Australia. Especially influenced by the work of Marc Chagall, Jackson Pollock, Fernando Zobel, Jean Miotte and Gerhard Richter. Abstract acrylic paintings with spatula techniques. Studies of Judit Reigl´s and Simon Hantai´s work: Educational journey to Budapest, Hungry. Abstract acrylic paintings with spatula techmiques. Studies of the work of Gerhard Richter: "Panorama", Exhibition Neue Nationalgalerie, Berlin, Germany. Abstract acrylic paintings with spatula techniques. Studies of the "Informel" and Abstract Expressionsm 1957-1962, Kunsthaus NRW Aachen-Kornelimünster, Germany. Abstract acrylic paintings with spatula techniques. Studies of the "Informel" and Abstract Expressionsm 1946 - 1964: Exhibition "Le Grand Geste! ", Düsseldorf, Germany. Studies of the work of Antoni Tàpies, " Mira La Mà...", Fundació Palau, Caldes d´Estrac/Barcelona. Abstract acrylic paintings with spatula techniques. Studies of the work of Gerhard Richter and Fernando Zobel. Educational journey to Barcelona and Spain. Abstract acrylic paintings with spatula techniques. Studies of Gerhard Richter´s work: Abstrakte Bilder, Museum Ludwig, Köln, Germany.